The operating principle of the actuator of electromagnetic clutch is an electromagnetic effect, but torque transmission is mechanical. The difference between electromagnetic clutch and the regular clutch is in how they control the movement of pressure plates. In the normal clutch, a spring used to engage the clutch whereas in EM clutch an electromagnetic field is used for engagement. The electromagnetic clutch comes various forms, including magnetic particle clutch and multi-disc clutch. There are even no-contact clutches such as hysteresis clutch and eddy current clutch. However, most widely used form is single face friction clutch. 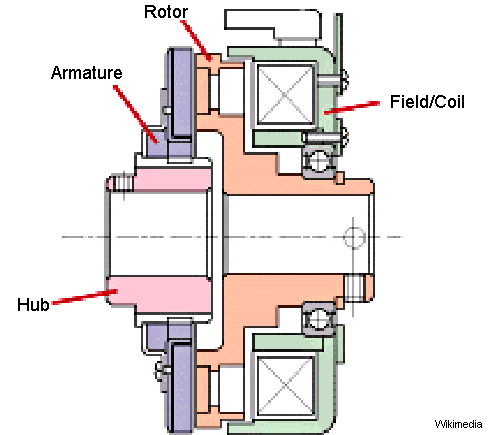 The main components of EM clutch are a coil shell, an armature, rotor, and hub. The armature plate is lined with friction coating. The coil is placed behind the rotor. 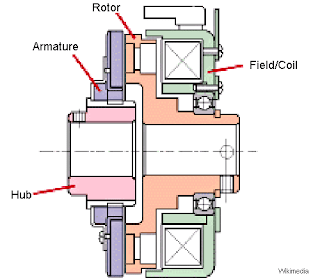 When the clutch activated the electric circuit energizes the coil, it generates a magnetic field. The rotor portion of clutch gets magnetized. When the magnetic field exceeds the air gap between rotor and armature and then it pulls the armature toward the rotor. The frictional force generated at the contact surface transfer the torque. Engagement time depends on the strength of magnetic fields, inertia, and air gap. When voltage is removed from the coil, the contact is gone. In most design a spring is used to hold back the armature to provide an air gap when current is removed. Operating temperature is limited because at high-temperature insulation of the electromagnet gets damaged. The risk of overheating during the engagement. The brushes used to energize coils are needed a periodic check.